With summer fast approaching, I’m sure everyone has been scouring the web, brainstorming with colleagues and studying the iREAD Resource Guide for inspiration. Upcycled Map & Atlas Crafts – You’d be amazed how many staff members have old maps lying around at home. There’s no better time to use them! Silent Library Challenge with an International Twist – This link has some great ideas to spark some challenges of your own if you decide to go this route with your teens. Henna Artist & Program – Henna is always a hit, and it fits in beautifully with this summer’s theme. International Game Night – table tennis, Mancala, Go, Chinese Checkers, and more. We are also taking our book clubs “on the town,” and meeting at different places in the community. We are continuing the summer theme with the titles that we’ve chosen as well. My older teens will be reading John Green’s Paper Towns which is a roadtrip novel, Laini Taylor’s Daughter of Smoke and Bone which is set loosely in modern day Prague and Patricia McCormick’s Never Fall Down which set in the very real, war torn country of Cambodia. How about your library? 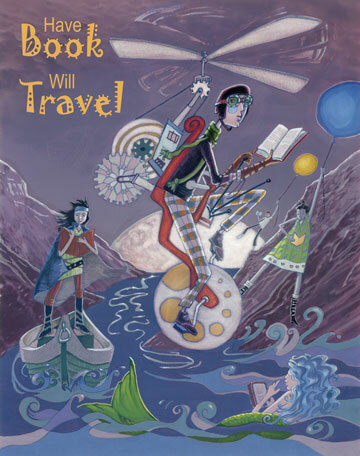 What fabulously inventive programs do you have planned for “Have Book, Will Travel?” I’m sure a few people might still be looking for ideas to round out their programming schedules. As an Adult and Teen Programming Librarian, this is awesome for me. I get to blend together the two sides of my job in a fairly fantastic way. I realize that this may not be as easy for everyone, as it involves coordination between people…departments…budgets. But, while the work may be a challenge, the reward is pretty great, too. At our library, we’ve begun opening up programs classically marketed just to teens to both teens and adults. No matter what the topic may be: crafts, fitness classes or movies, we’ve got interest in the topics coming at us from all ages. At first, my immediate reaction was of the, “No way, no how,” feeling. How was I going to have our teens and adults in the same group without losing the exclusivity and freedom that being in a library could potentially provide my teens? Our area is one that has a very miniscule amount of teen participation. There are a few strikes against us: we live in a village that puts high value on sports and school-related activities, the library is in the downtown vicinity, so teens who are coming to the library have to actually be on their way here already…we don’t get much walk-in traffic. What I saw at first was the potential to have an attendance increase. What about older teens who might not come to something they feel is too young for their age group? I decided to give it a try. The program that I first said yes to marketing to both teens and adults was a craft program. It was during the winter, and I was teaching about finger knitting and finger crochet. The idea wasn’t major in anyway; it was something cheap (we’d gotten a MASSIVE donation of yarn), and it was something I could teach myself to do (thank you Pinterest and YouTube)! As registration was going on, it became clear that there were going to be just about as many teens as there were adults. We had so many interesting pairings in that room. 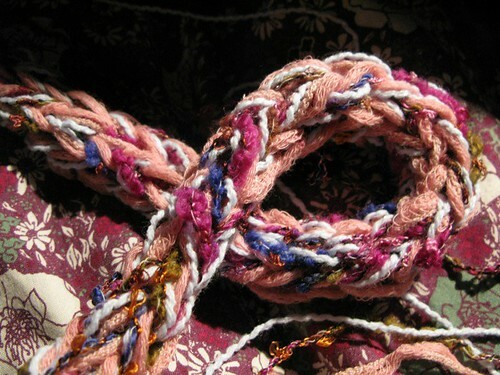 I had a 19 year old guy chatting with a grandmotherly patron about the crocheting she was teaching her grandchildren. I had teens from one of our high schools helping the adults in the room! I was just so impressed to see that there were little pockets of conversation everywhere I turned. Now, as I do what we now call the Just Wing It Craft Hour every month, I see more and more moms signing up just to get a night away. I see teens signing up as well. But, my personal favorite is that I often see mothers and daughters or mothers and sons coming in to do our craft for the evening because we’ve given them more than a program that teens can be “dropped off” to. Rather, we’ve given them something that they can do together. I get repeat faces of all kinds—teens are now coming and doing the craft alongside a family member. Even when mom or dad can’t come, an aunt or cousin is dragged in. I realize now that it wasn’t so much about keeping adults and teens separate. We do that with our age specific programming already. What we’re doing now is building a new kind of community. While many of us know that Pinterest can be a fun distraction, we’ve also been finding more and more ways to use it in a professional manner at work. Think about all of the people you know who are doing inspiring, creative programs both at your library and and beyond. Many of those people are sharing their programs – from the planning, to booklists, to supplies, and even more – online. Hidden among the mouthwatering recipes (and, yes, pictures of Ryan Gosling) are some wonderfully useful pins. It’s wonderful to be part of such a collaborative and sharing library community. The above links are just a place to get started. If you are looking for something – no matter how seemingly strange – odds are that you’ll find something to inspire a library program of your own. 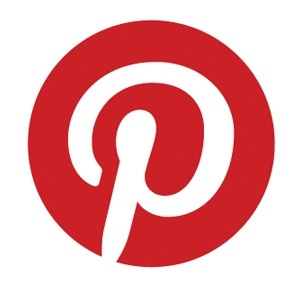 Have you used Pinterest to inspire programming at your library? If so, we’d love to hear about your favorite boards. Today a program failed. I had all the elements: a recently released movie that should appeal to tweens and teens, marketing AND a raffle of a copy of the movie and the book it was based on, and snacks. The combination worked well last summer, and it was fine in the fall programming line-up too, but today it was a bust. After a half hour watching the movie in a big meeting room by myself I decided to pack it in and do something more useful, so I’m rewriting (again) this long overdue YASF blogpost. • Fifteen minutes before your program starts and your star presenter is an hour away, stuck in traffic. • The presenter showed but your meeting room equipment is failing and they can’t project their multimedia presentation. • The presenter showed on time and everything works; but, for some reason the hundred teens you estimated turns into only four actual teens who show. Mostly likely half of those that showed are the volunteers who helped with set-up and are only staying to tear down. • What if too many kids show? Word of mouth got around and now anime or manga club gatherings need a staff of ten just to keep the peace, but there’s still just the one teen librarian to manage it. • You lost (misplaced, forgot to order, or didn’t get the right amount for) the honorarium check and now the presenter is refusing to present and is, in fact, storming out angrily. • Insert your horror stories in the comments, I know you’ve got at least one. These are the times when it would be nice to have a panic button that would deploy a regiment teen volunteers that are trained and ready to turn your failing program into a success. But, as great as teen volunteers are (and they are really great) they aren’t magical. Maybe this is why I like planning programs like today’s movie. I also sigh with relief every time I schedule a crafting, video game, or book club program. These programs still require time, some expense, and effort on my part, of course; but for the most part, (barring the unforeseen failure of a free movie in the battle of free movie vs. a very nice day outside.) they are safe and reliable and we know what and who to expect. Best of all, I rarely or never need to bring in someone from outside the library to do these programs. Too bad they can’t all be craft programs. (No, they really can’t all be craft programs.) When they fail, they do so quietly and without fuss. The only damage done is to my ego. But the “safe” programs are just not enough. To let my programs thrive, I must bring in outside presenters. If the solution to “Programmers Anxiety” is not to stick to the safe programs, what is it? Well, the first action is going to be a no-brainer; gain the experience all while expecting things to go wrong. Stress out about it if you must (I must.) Don’t be afraid to plan programs that are going to stress you out. The first author visit that I ever tried planning was a dismal failure compared to the second and so on. Experience also allows for that holy grail of programming: knowing your audience. I know that my audience is very big on writing workshop programs; so, my second author visit was a combo. One program was a standard author visit and then after about an hour break the author did a writing workshop. Many kids came to both, some came to just one or the other, but either way both programs went swimmingly. Knowing my audience much better now means I have a better grasp on the kinds of programs that really do require sign-up, and what works better as a drop-in. This doesn’t seem like a big deal, I know. Our Children’s Department only does sign-up because they are expecting too many people, as do our adult computer programs. For my programs though, it is frequently the opposite. For some reason, if teens must sign up at my library, then they will come. This also allows me to cancel or reschedule programs where I’m not getting any interest. Speaking of getting their interest; marketing is something we talk about at conferences and on blogs, but there is only so much advice that gets tossed around, and even less of that is applicable to any particular library setting. Using “word of mouth” is one of those things we get told a lot that is a mixed bag of usefulness. If the kids think to tell their friends and want them to come then word of mouth can be a great tool, but it doesn’t always work that way. Other advice is “take advantage of every marketing resource you have.” But, I don’t pull out the big guns of marketing on all my programs. I know the Anime Club is going to be well attended; I just have to let them know when it will be. But when I have a program I really want to do well then I push it on our website, social media sites, brochures, newsletter, electronic sign, and at every program I have leading up to the one I’m worried about, I’ll mention it. What do you do to ensure (as much as possible) successful (by whatever measure you deem success) programs?